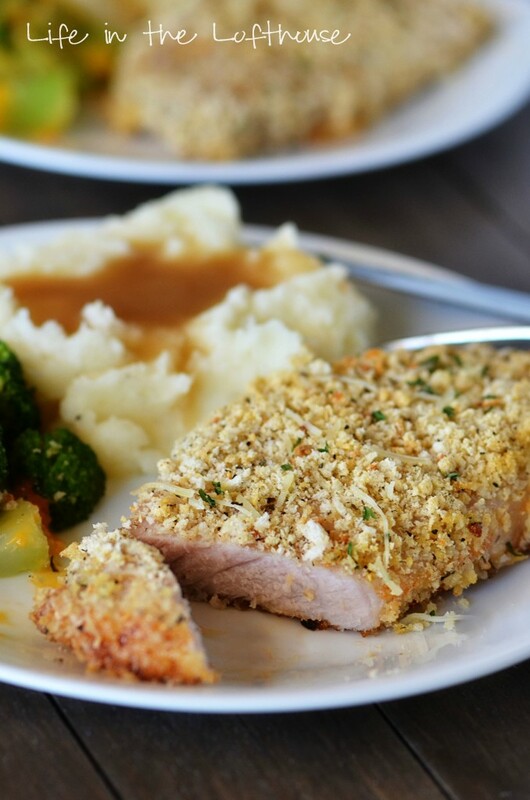 Baked Parmesan Pork Chops are tender and delicious with a crispy outside crust. 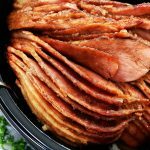 These are a family favorite at dinner time! I’ve tried pork chops a bunch of different ways. I love them fried and smothered (oh yes! 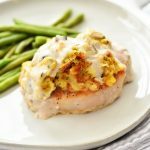 ), but when I’m leaning on a more healthy version it’s these Baked Parmesan Pork Chops I always come back to. 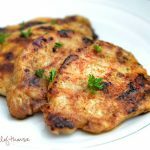 I’ve been making these pork chops as long as I’ve been making our favorite Ranch Chicken. They’re both very similar and totally delicious! 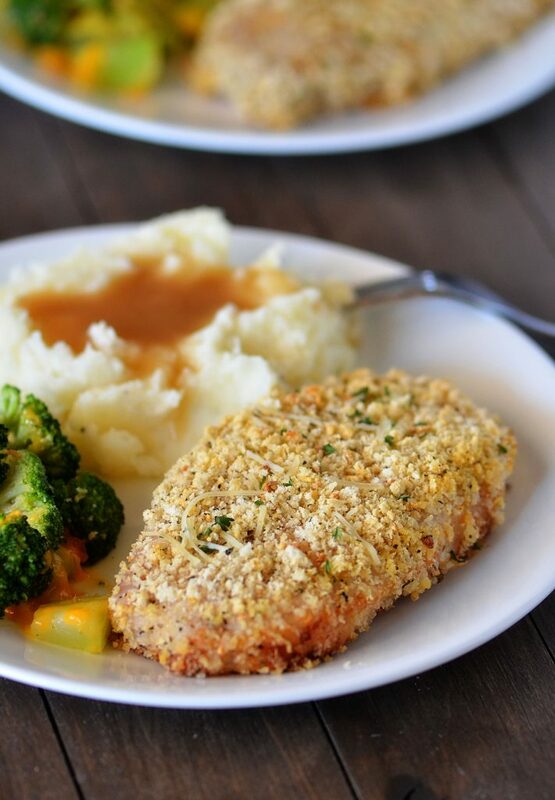 Seasoned Pork Chops baked to perfection. Your whole family will love these! Combine the Panko bread crumbs and Parmesan cheese into a large freezer baggie. Shake bag well to mix all together. 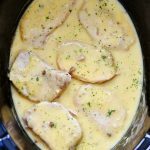 Dip each pork chop into the melted butter, and then drop into the baggie. Seal the bag shut and then shake well to coat with bread crumb/cheese mixture. After well coated lay pork chops into the baking dish. Repeat with all pork chops. Once all pork chops have been coated, sprinkle the remaining seasoning mixture over the tops of each. Bake for 30 minutes, uncovered, or until cooked through. Serve immediately. What kind of pork chops did you use? I just made the pork chops tonight…. So delicious! 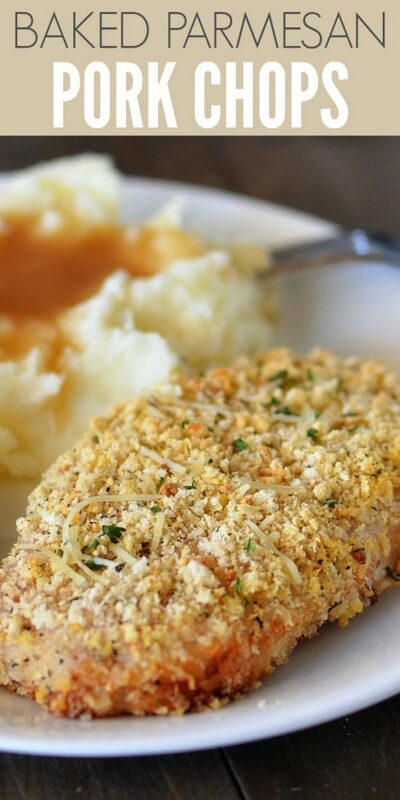 Have you tried it with the plain panko crumbs? I already have some of those in the house. Just wondered if I could just add some seasoning. Thanks. Looks delicious. I was just at the store last night buying more ingredients for that fabulous Ranch Chicken of yours! Definitely going to give the pork chops a try! 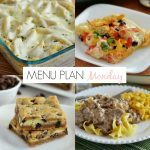 I have made these and they are delicious, but just wondered what you thought about how I could turn it into a freezer meal?! I was not sure on this recipe when I was reading it. But your pictures alone make my mouth water. Anyway, I tried this recipe — and my husband and I only have good things to say! Easy, fast, delicious — what more could you ask for? It’s pretty healthy too!!! Bonus! 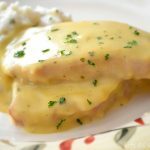 I have bone in pork chops what changes to cooking time and temperature do I need to make?